Short Intro: What's Dragon Ball? Toriyama Akira wrote the Dragon Ball Trilogy, consisting of three seperate story runs: DragonBall, DragonBall Z and DragonBall GT. The story line of Dragon Ball, the first installment in the trilogy, centers around our main-man, a little pint-sized martial arts twerp named Son Goku. 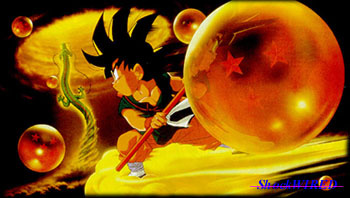 Goku is on a quest to reunite the 7 magical orbs known as Dragon Balls. When all 7 orbs are reunited, the Shen Long, or Mighty Dragon, appears and grants whomever called him one wish. So, as you can imagine, the Dragon Balls, as they're called, are a huge comodity on Earth. So... everyone in the galaxy wants 'em!